Did Ghana Palaver hear it right that President J. A. Kufuor is going round the country condemning the threatened “skirt and blouse” voting among NPP supporters and pleading that the NPP requires absolute majority in Parliament? We do not believe it. But if it is true, we would only refer our dear readers to the Daily Graphic of Monday, July 2, 1979, at Page 4. The year was 1979. Presidential and Parliamentary elections had been held on June 18, 1979. The PNP's Hilla Limann had won the Presidential elections but had not won an absolute majority, and therefore was required to go into a second round run-off with PFP's Victor Owusu who had come second. The PNP had won an absolute majority in Parliament and the PFP had emerged as the largest minority Party in Parliament. J. A. Kufuor had been elected as the Member of Parliament for Atwima Nwabiagya on the ticket of the minority PFP. In the July 2, 1979 issue of the Daily Graphic referred to, Victor Owusu and the PFP, including then Hon. J. 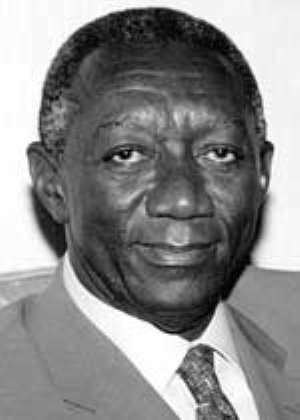 A. Kufuor, took out a full-page advertisement in which they extolled the virtues of “skirt and blouse” voting and urged Ghanaians to vote for Victor Owusu as President because “when you have the President and Parliament coming from the same party, you have the recipe for legalized dictatorship”. The Constitution calls for the separation of powers of the Presidency and the Parliament. The Constitution makers realized that when you have President and Parliament from the same party you have the recipe for legalized dictatorship. The Constitution makers gave Ghanaians a chance to prevent this by insisting on a second ballot. This is your chance to PROTECT THE SPIRIT OF THE CONSTITUTION. Together with the P.F.P. your votes in the recent Presidential elections totaled more than ONE MILLION ONE HUNDRED THOUSAND against only some 600,000 for the P.N.P. We appeal to you now to use your votes to ensure a democratic way of life, for this country. This is no longer a question of personalities it is a straight two way fight. If you vote for Victor Owusu then the separation of powers, essential to preserve freedom is guaranteed; if you do not vote or vote the other way you will have put executive power and legislative power into the hands of one group of people who have shown us before what they can do with absolute power. “Power corrupts and absolute power corrupts absolutely”. Please do not allow any group to enjoy absolute power. We of the 'Ghana Palaver' would like to ask: So is it because J. A. Kufuor is now President that “skirt and blouse” voting is suddenly not good? Does the NPP have any principles? Does President Kufuor have any principles? Or is he simply a hypocrite? The July 2, 1979 Daily Graphic advertisement is reproduced at Page 5.